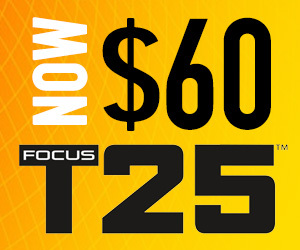 You are here: Home / Reviews / We’ve Analyzed Focus T25 vs Insanity Max 30: Which One is Right For You? When looking at these two programs, T25 vs Insanity Max 30, you will see a lot of similarities and might think these two programs are more or less the same. But once you get into the programs, you get a very different tone from Shaun T. Depending on your fitness level and goals, one program will be better suited for you. They’re both great programs and both will cut inches from your waistline, blast fat, and improve muscle definition. Insanity Max 30 vs Focus T25: Which Program is Right For You? In either program, you will lose weight. Both Focus T25 vs Insanity Max 30 will get your heart rate up and covered in sweat. The main difference you’ll notice in the workouts themselves is that Insanity Max 30 pushes you harder (both in the workouts and through Shaun T’s style). Insanity Max 30 workouts ask that you push yourself at each move as long as you can bear it — there are no reps and you perform each move until you reach your limit. The idea is that you will be able to do more moves and last longer each week. Shaun T takes more of a drill sergeant role to his coaching in Insanity Max 30, almost yelling at you to hold out a little while longer and keep focused. In T25, Shaun T wants you to focus on good form (and not just go 100 m.p.h.). He still does a great job at motivating you, but he is nicer about it in T25. T25 also does a better job at showcasing modifier movements, which are great for those early workouts while your body is still getting used to the program. T25 workouts are usually ask that you do as many reps as you can in 30 or 60 seconds — again stressing form more than volume. So What Will I be Doing in Focus T25 and Insanity Max 30? Now that you understand how the intensity differs in the workouts, you can understand how the programs are structured. T25 starts by focusing heavily on cardio in the âAlpha phase.â There are five workouts you do each for the first five weeks, and a sixth ab workout you do each week. There is more lower body workouts that will improve endurance, begin to shape your glutes and thighs, and drop fat fast (you’ll likely lose the most weight in these first five weeks). After five weeks, you begin the âBeta phase.â Here, you have the option to add resistance (if you have weights or bands at home). While still including plenty of cardio, you will do more body resistance work that will build strength in your arms and shoulders, and begin to see more inches shed around the midsection as you build your core muscles. In month two of Insanity Max 30, you still do two cardio and two strength workouts, but they use more complex movements, use longer intervals, and is a much bigger challenge. Both programs give you similar workout calendars and nutrition plans. Both have deluxe kits that give you a few more core workouts, some food prep storage containers, and some extra equipment that go along with the workouts. You can expect two months of great workouts and you will lose weight with either program. As mentioned earlier, the biggest thing to know is what kind of workout you prefer and where your fitness level is beginning the program. Since T25 has tons of great modifier workouts with each exercise, it is the best program if you are new to the at home workouts programs. If you have good endurance and want to see if you can accomplish something a little more challenging, Insanity Max 30 is your best bet! If you can’t decide, check out Beachbody On Demand and have full access to Focus T25, Insanity Max:30 and all other Beachbody programs for only $8.25 a month (and 14 days free)!